We may not begrudge our clothes and textile furnishings for forgetting to remind us of our mother-in-law’s birthday, but we will expect them to play with us, get to know us, and make living our lives more efficient. Imagine, your self-driving car notifying you of your stressful day and suggesting you play relaxing music. Your car knowing your calendar, especially the important presentation and the meetings you have back-to-back. Yet, your car improved its confidence of your stressful state by synchronising the calendar information with physiological data collected from the textiles on your car seat. As you walk through your house, your home automation system greets you by name – but there is not a camera in sight. In fact, the hallway rug can identify you just by you walking on it – your signature pace and walking style evidenced by the unique illuminated patterns that temporarily remain on the rug after you walk over it. Your kids hug you to welcome you home, one of them holding a little teddy bear that has a bowtie that looks… slightly different today. Perhaps they figured out how to code an algorithm for the bear, so that now when you squeeze it the bowtie illuminates a polka-dot pattern rather than the usual stripes. Sounds a bit far-fetched? Not very 2016? Well, this was a sneak preview of your future. The textiles that we wear, sit, walk, or lay on will become increasingly intelligent over the next couple of years. This is all thanks to the birth of Smart Textiles – an industry born from the ‘Facebook-official’ marriage of the Engineering and Textile industries. However, if you think the concepts suggested in this sneak-peak to the future are a long way ahead, think again. This is not really public knowledge, but academic research is arguably 20 years ahead in innovation compared to what is available in the industry. The ideas of Google’s Project Jacquard, Wearable Experiments’ Nadi Yoga form-correcting trousers, Threadsmiths’ clothing that can never get wet, and The Unseen’s luxurious colour-changing bags and accessories all stem back to the first time Smart Textiles was defined and recognised as a potential new industry – in 1989. Although projects related to smart textiles were present in the 1960s and 70s, in 1989, smart textiles were defined to ‘sense stimuli from the environment, to react to them, and adapt to them by the integration of functionalities into their textile structure’. Since then, we have fine-tuned this definition. Smart Textiles are engineering-enhanced traditional textiles which enable the detection, reaction, and adaptation to external stimuli. Smart Textiles can be further categorised as passive, active, and intelligent respectively. Furthermore, functional electronic textiles are smart textiles integrated with electronics that are flexible, stretchable, and washable. Fast forward to present day, and we still have not got woolly scarfs with in-built nano-scale heaters to keep us warm on a bitterly cold night about the town. Why? This is because Smart Textiles are not considered an industry in its own right yet. Actually, Smart Textiles are considered a sub-category of wearable technology right now. The Wearable Technology industry, worth 7.14 million US dollars in 2015, is expected to be worth 12.64 million US dollars in 2018. The global retail value of smart wearable devices is predicted to be worth 53.2 billion US dollars in 2019. Therefore, marketing smart textiles as a subcategory of that makes a lot of business sense. Just imagine the capabilities of your Jawbone in a textile wristband or gym-vest that still has its signature Jawbone-aesthetic but is even more comfortable on the skin. Although commercial smart textiles are still in their infancy, the progress of smart textile electronic engineering inventions and material science research indicate the potential surge of convenience we all can gain when smart textiles are finally purchasable. Think of energy harvesting. The concept of harvesting energy that comes from the distortion of a system and storing it to power another system. Have you ever looked at your fitness app, looked at your statistics after a run and thought ‘I must have used up a lot of energy, could we harness that to power something else? Like my dying phone battery?’ Well that is possible, but perhaps not in the way you would first think. You may be thinking about the kinetic energy we could collect from our clothing whilst we exercise. We move, wiggle, and fidget our clothes every day that we wear them but recent research has revealed that, using artificial intelligence algorithms, we can distinguish between different activities by collecting data around our hips. However, the greatest impact on our bodies due to activity is experienced at our ankles and feet – information typically utilised for gait analysis. 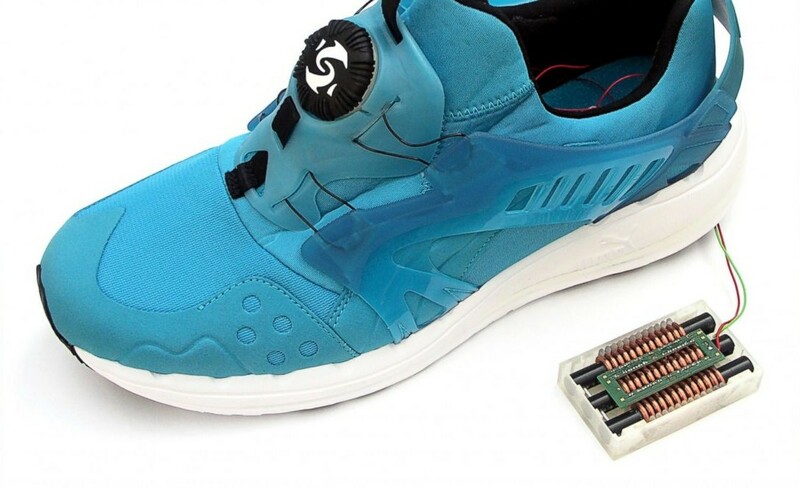 So, what if we had energy-harvesting footwear that generated energy with every run, skip, and jump? No more dying phone battery before your favourite song during your workouts. In this way, your phone will be powering itself as you workout, and perhaps, your phone battery level will be greater than when you first started your workout. Yet, let us change our perspective here. How about we use the kinetic energy generated as we workout for not only aesthetic reasons but also to inform yourself and those around you of how much effort you are putting in? By embedding tiny sensors into the fabrics of our gym-wear, patterns on the clothing that existed purely to look attractive will be given more substance. Thanks to technology like thermochromic ink or nano-scale LEDs, the patterns could change colour in response to your emitted body heat or illuminate in different colours to signify how hard you are working out. Additionally, if Phase Change Materials (PCMs) were incorporated into the manufacturing of the gym-clothes you may actually sweat less. PCMs respond in a way that regulate your body temperature, so as you heat up the PCM scientifically distort resulting in cooling you down and vice versa. The way that smart textiles can change our clothing must be an exciting challenge for the fashion industry. Once smart textiles have a reliable, scalable, and customisable way of being manufactured it will not take long for smart textiles to be sold on the roll to fashion houses globally. The question is if smart textiles will be marketed, and sold in a way that will encourage materialism or minimalism. For the engineers and industrialists, the technological or scientific specifications of these smart textiles will influence their features, applications – and depending how they are applied will effect if they are made into products seldom used, or as a product that help us form more memories and enriched experiences in our lives. The global impact of smart textiles is a natural progression for society as we become more wirelessly connected and urbanised. Previously, FashNerd discussed the future of the Internet of Things (IoTs) and how it will affect us – concluding that improvements in healthcare, manufacturing, and retail are predicted to be positively affected the most. However today, I am not going to discuss the Internet of Things, I am going to explore the plethora of diverse sources that smart textiles can extract data from. Extracting data from smart textiles could to enhance the quality of data collected into the Cloud which can increase the efficiency of IoT. Wired Magazine has investigated the future of sport and sport entertainment through the advancement in sport science and wearable technology. Taking this notion further, what if we were to embed electronics into the fabrics of sport players’ uniforms? I am a big fan of collecting the multitude of physiological data that can be collected from sports uniforms in real-time. They can be streamed onto the coaches’ tablet during matches, giving them statistical evidence of how their players are performing. The same data collected from these uniforms could be filtered and shown on television, sport arena screens, and any other screens streaming the game. Like the statistics on sports cards we used to have as kids, comparing players to each other, but this time the access of these statistics in real-time can make us even more engaged in a live match. Why stop at uniforms? What if we embedded electronics within the fabric surface or locate them in the core of textile sporting balls – like the soccer ball, American football, or tennis ball? If they were engineered in such a way to enhance the projectile distance of the ball and the manner how they travel through the air, sport matches could reach galactic-level. Wimbeldon, the NFL, FIFA, and the Olympics would never be the same again. Similarly to FashNerd’s article on the Internet of Things, I also agree that smart textiles will have a substantially positive affect on the healthcare industry. Our urbanised way of living can be described as ‘the age of the city’. As a result, the subsequent congestion and rising population causes the amount of stresses upon the healthcare system to reach its breaking point. Currently in the UK, student nurses have lost their grants to attend University, student doctors are standing up for their rights, and there is a battle for hospitals resources and attention as the population grows further. Consequently, as we globally become more urbanised it would be a welcomed change for the healthcare system to become further improved thanks to smart textiles. Ideas such as technological medical tattoos sparked media attention last year, and that trend will continue in the next decade. If Moore’s law continues to hold, it will soon be possible for your sensor-integrated patch to supply your medicine at the correct time with correct dosage. Bandages will help heal wounds by ensuring comfortable temperatures to aid recovery. All of this could be done by remote monitoring – doctors attending to patients through smart textile bandages and medical patches. Data being collected into the Cloud, stored into hospital databases, hence allowing hospital traffic to be better managed. More so, the security industry can also benefit from smart textiles. Using gesture control via proximity sensors embedded into gloves, we could control dangerous equipment and physically manipulate harmful chemicals without even touching them – making the workplace for those in hazardous environments safer than it would be otherwise. This may be very far-fetched but superhuman strength could be possible by wearing garments made from smart textiles. Firefighters could save even more lives by wearing improved uniforms integrated with enhanced PCMs and technological features that can allow them to lift and carry unimaginable weights. So now, you are probably thinking ‘All this blue-sky thinking is great, but will all of this happen and will I expect to order my smart textiles garment, cushion, curtains, or gait-recognising rug soon?’ Searching on Google Scholar or Academic Research Databases will answer your question. The technologies of the possible smart textiles applications I conjured up in this article already exist the products themselves have not been created yet. With a couple of years, hopefully my PhD research will lessen the time we have to wait for our future Amazon order of smart textile interior furnishings to fill our smart homes. The future of wearables will be smart textiles and the future of traditional textile furnishings will be smart textile furnishings. It is just a case of when a consensus and reliable manufacturing and powering method to create functional electronic textiles – currently in its prototype stages in engineering and textile industries – will transcend the academic realm to become reliably powered and commercially scalable. Until then, get excited – when smart textiles finally arrive commercially, we will never look at our blankets, jackets, and cushions the same way again. Flexible Electronics in E-Textiles + Wearable Tech PhD scholar student.